The ruined buildings of Cornish tin mines have fascinated me since childhood, when we used to spend summer holidays in Penwith. I remember them as silhouettes against the Cornish landscape, grouped on moorland beside roads and perched precariously on cliff tops, their workings extending for miles under the sea. I researched the buildings and places and the processes and people involved in tin mining – long ago and more recently. Reading about the lives of the miners and the bal maidens, investigating the geology that made Cornwall and West Devon such a rich source of minerals, and visiting the area again helped me re-connect with the subject. I produced a range of fabrics that reflect the sea and the mining landscape. The silhouette of a typical engine house and the restored winding drums and flywheel of the whim engine at East Pool mine reference the more distant past, while the headgear of South Crofty mine represents recent history and hope for the future. 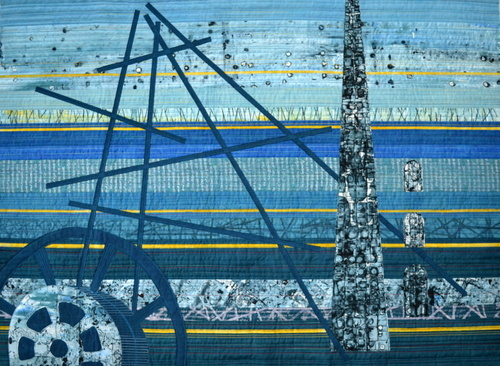 This quilt was selected for CQ@10 - the tenth birthday exhibition of Contemporary Quilt, a specialist group of QGBI. Materials: Hand dyed cotton; printing with Thermofax and breakdown screens and found objects. Methods: bonded/raw edge appliqué; machine quilting.